Geese are strange animals. One year the bridle likes tomatoes, the following year they even don’t look at it. In one part of the meadow, which was overgrown by bitter ivy, was also some common hogweed. Which the geese ate with taste. Ground ivy not. So I left the hogweed for them. But the new breed of geese did not even think about nibbling it. So I had to weed quite a bit of hogweed. Giant hogweed (Heracleum mantegazzianum) is a large up to two meters high perennial plant with red spotted stems. The juice can after 24 hours cause red itchy spots, with burns-like swelling and blistering (fyto photo dermatitis). If sap gets into the eyes, it can cause blindness. 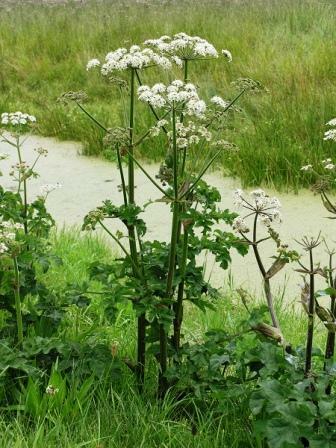 Older plants of all types of hogweed contain furocoumarinenen, a strong smelling essential oil that makes the skin sensitive to sunlight (fotosensitivity). The common hogweed (Heracleum sphondylium) is less dangerous. Despite short sleeves, but with gloves, I didn’t feel anything. Young leaves and shoots (before the leaves are completely unfolded) according to various writers are even edible. Both fresh shoots and the young leaves can be eaten. Peeled, juice on drying stalks forms sweet white crystals that are a traditional local delicacy around Latvia. The dried seeds are aromatic and tasty. The first I could easily pull out of the ground with the roots. Then it went further with varying success. It took an hour before my penny dropped. The opportunity to eradicate the weeds with the roots turned out to be perfectly predictable. Once the plant blooms and makes flowers or bears seeds it gets a more woody stem, and the connection to the root is firmly enough to pull them out with root. Is the stem, however, already dried, the root is deadlocked and the soil must first be pried deep around the plant to get the root out. As long as the plants are young without inflorescence the leaf stalks break off above the roots. So I let them on the spot, until they flower, but no seeds are formed yet. Then they go out every week with the root. It makes little sense to pick the leaves above the ground. In retrospect, it does seem to me illogical. And it would not surprise me if this would apply for other Umbelliferae, and even for other plants. With a little attention, you can learn a lot from Mother Nature, and get benefit from this knolledge.